Take advantage of the amazing deals on all FireplaceX Fireplaces & Inserts. 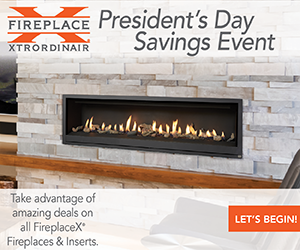 Act fast and save up to $500 on select FireplaceX Gas & Wood Fireplace & Inserts. Contact us for more details. Hot Cash for Cold Days on Qualifying Quadra-Fire, Heat & Glo & Harman Products! Hot days are still ahead, but it’s never too early to start planning for chillier weather. Wouldn’t it be nice to head into winter with a new fireplace, insert or stove in your home? Save up to $500 when you sign up now, but only through 9/24/18! Visit us today or get your exclusive coupon code for participating products from Quadra-Fire, Heat & Glo & Harman!